Do your kids love the water? The sea has long inspired residents of southern New England, a region that enjoys the benefits of countless water-related activities. Families can choose from any number of sailing, kayaking, or marine-studies programs for their children this summer. Cedar Island Marina, in addition to offering boat slips, picnic and recreational areas, an inground pool, fitness center, and dining and other amenities, is also home to the Cedar Island Marina Research Laboratory which studies Long Island Sound and its inhabitants, and offers educational programs to the public. Educational programs offered by Cedar Island Marina include a traveling touch tank led by educationally trained marine biologists who teach participants about Long Island Sound and the species that live there, and guided field exploration tours and field trips at Hammonasset State Park where participants can experience what it’s like to be a marine biologist and enjoy a hands-on learning experience. There is also a Marine Biology Educational Program offered during the summer where students can learn about Long Island Sound through research and scientific experiments alongside marine biologists. Group sizes are small, and children also have the opportunity to canoe, swim, and more. Cedar Island Marina is located at 34 Riverside Drive in Clinton. For more information, contact 860-669-8681 or info@cedarislandmarina.com, or visit cedarislandmarina.com. Nestled on the Connecticut River and a staple of the Essex community, the Connecticut River Museum keeps the history of the river alive and well through year-round educational programs for adults and children. The museum always has something to offer, including exhibits, EagleWatch cruises, self-guided and guided tours, group tours for adults and schools, and a number of community events throughout the year including the annual Essex Shad Bake in the summer. Youth programs include its weekly Summer Adventure Camps for ages 6 to 12 where children explore topics ranging from Native American lifeways to Colonial farming, archaeology in the Connecticut River Valley, and life at sea and on the river. The camps run Monday through Friday in July and August from 9 a.m. to 3 p.m. at the museum as well as the Bushnell Farm in Old Saybrook. The cost runs from $235 to $250 per week, and after care is available from 3 to 5 p.m. for $50 per child per week. The Connecticut River Museum is located at 67 Main Street in Essex. Winter hours (Columbus Day through Memorial Day) are Tuesday to Sunday from 10 a.m. to 5 p.m. and summer hours (Memorial Day through Columbus Day) are 10 a.m. to 5 p.m. seven days a week. Admission is $10 for adults, $8 for seniors, $8 for military and immediate family, $7 for students, $6 for children ages 6 to 12, and free for members and children under 6. For more information, visit ctrivermuseum.org. Based in Old Saybrook, the Maritime Education Network is a non-profit organization that was founded in 1999 and promotes education about Long Island Sound and other maritime subjects. Although only open from March to the beginning of December, the network conducts year-round programs; including field trips for local schools, water safety programs for children, touch tank programs, middle and high school programs for at-risk students for credit, and more. Summer programs, which teach students about the history of Long Island Sound and maritime life, include Marine Science Extraordinaire for Grades 4-6 which runs Monday through Friday in June, July, and August ($325 per week); Marine Discovery Program for Grades 1-4 which runs Monday through Friday in June, July, and August ($260 to $325 per week); and Marine Explorer Program for Grades 5-9 which runs Wednesday through Friday in June, July, and August ($300 per week). For the Marine Science Extraordinaire and Marine Discovery Program, students are taken to different beaches to learn about each one’s unique species, and for the Marine Explorer Program children are taken out on boats with a marine educator to learn about maritime life, sailing, water safety, and more. Programs have a student-to-teacher ratio of 3 to 1, and each week has a different theme. Before and after care is available for all programs, and scholarships are available. Maritime Education Network, Inc. is located at 203 Ferry Road in Old Saybrook. For more information, visit maritimeeducation.org. Three- to 16-year-olds, whether they are budding nature lovers or future marine biologists, will find something that piques their interest at the Aquarium, either through day programs or overnight activities. Mystic Aquarium is leading the way this summer with programs that join forces with other regional marine-focused agencies. For one week in July, fourth- to sixth-graders can study the environments of marine animals. In conjunction with Project Oceanology, students will discover how environmental changes affect animals and how they must adjust to such change in order to survive. Students in Grades 7-9 can go behind the scenes of the Aquarium’s exhibits to give them better insight into marine conservation, while also spending time on Long Island Sound, meeting scientists, and participating in experiments. A highlight of the Aquarium’s exhibits is “Discover Long Island Sound,” a hands-on experience that combines digital interactives with a watershed model. Participants visiting the 12-foot-long water table can touch live native invertebrates, and see the inner workings of a water wheel, rain cloud, and dam. Cost starts around $300 per week, visit mysticaquarium.org/fun-learning/summer-camps/ for more details. In June and July, kids ages 8-14 can hone their sailing skills along the Seaport’s beautiful waterfront. Both beginner and intermediate sailors can benefit from a week on the water, which also includes sessions on knot-tying, boat operation, and sailing vernacular. Both half-day and full-day sessions are available. Want to super-size your kid’s sleep-away camp experience? They can spend a week learning to sail during the day and bunk at night aboard the Joseph Conrad. More than 350 participants ages 10-15 have joined the tall ship excursion, which focuses on camaraderie and team-building skills. Experienced counselors and sailing instructors will lead student activities. Other water-related programs available at the Seaport for school-aged children are: building and rowing their own boat; competitive racing on the Mystic River; a split-day program with Mystic Aquarium that focuses on animals and habitats of the Mystic River and Long Island Sound in the morning and sailing on the Mystic River in the afternoon; hiking and animal exploration at Denison Pequotsepos Nature Center in the morning and sailing at the Seaport in the afternoon; and a new joint program with Project Oceanology that focuses on marine science activities for two-and-a-half days and afternoon sailing at the Seaport. Program costs range from $300-$900 depending on type, length and overnight options. Mystic Seaport Museum members receive a discount; and financial aid is available to families in need. Visit mysticseaport.org/learn/summer-camps/ for descriptions and registration information. This Stonington-based group offers sailing lessons to kids ages 16 and older and, once they qualify, are able to rent sailboats for a fun water excursion with friends and family. Two years ago, NESS launched its adaptive sailing instruction program for mariners with cognitive and/or physical disabilities. In one week-long day camp, first- to third-graders will learn how to use STEM (science, technology, engineering, and math) to maintain exhibits, care for animals, and protect the environment. Young scientists will also visit Bluff Point State Park and the Connecticut Science Center as part of their marine biology experience. Fourth- to sixth-graders will investigate estuaries, fresh water, and marshes, during their week-long camp, and take an oceanographic cruise with Save the Bay to study marine environments. And you can’t leave out the middle- and high-schoolers! These campers will also participate in marine biology activities and a night among the exhibits. Summer camps run late June through the end of August, and include adventure sports like surfing, fishing, powerboating, kayaking, geocaching and navigation; and a variety of marine science programs. There are camps which help little ones get familiar and comfortable in the water, as well as ones that focus on ocean exploration, marine biology and environmental stewardship for older children. Programs start around $230 per week. NESS also offers powerboat certification; lifeguarding, CPR and first aid courses; rentals and boat charters; private lessons; and special, weekly shorter programs for friends and family, including Saturday Eco-Tours at Ocean Beach. NESS’s guides lead participants through local waterways to observe wild wonders. The two-hour trips are open to experienced and novice boaters and all equipment is provided; visit nessf.org for more information. Junior sailors – from the novice navigators to experienced mariners – can choose from two sessions this summer to hone their skills on the water. Held at the Niantic Bay Yacht Club, the three-hour classes are designed to give students a refresher of their accomplishments or master new abilities. Beginners, who have one year or no previous sailing experience, will learn in small groups combined with whole-class instruction. Along with basic boat care, some material covered includes: the basics of sailing, wind directions, parts of the boat, rigging, steering, sail trim, tacking, jibing, knots, towing and docking, capsize and recovery, and bailing. This class is taught primarily in Optis and Blue Jays. Morning and afternoon sessions are available. Opti Green Fleet students will learn basic racing skills, which can be tested at local Eastern Connecticut Green Fleet Regattas. The regattas are for students interested in competitive racing. Personal boat ownership is encouraged. The older, beginner sailor will benefit from a double-handed class, instruction that focuses on basic boat care and racing, along with seamanship and skill-building drills. The class will be taught in 420s, Blue Jays, and the academy’s new RS Fevas. Is your child excited to learn racing skills? Then the Optimist Racing class could be the perfect match. This class is longer in length to provide sailors more time in the boat, which is important in building stronger skills. Wind steering, race preparation, and strategy development are just a few of the skills for which students receive instructor assistance. In addition, the 420 Racing class students will be expected to represent NBSA in the ECSA team races and are encouraged to participate in Twilights, Weekend Races, and regattas (for which coaching will be provided). Rates start at $275 per session; visit nianticsailing.org to register. Imagine your child’s summer break including access to a 570-acre freshwater lake? At the YMCA’s Camp Watchaug, campers through Grade 9 can experience traditional summer camp, along with plenty of water-related activities. Located on Watchaug Pond in Charlestown, R.I., campers can enjoy a waterfront that is home to a swimming dock, boating dock and boathouse, water trampoline and playscape, sandy beach, and sand volleyball court. In addition to daily recreational swim times and swim lessons, students can sign up for “specialty camps” that are designed to focus on specific activities, in addition to traditional camping. 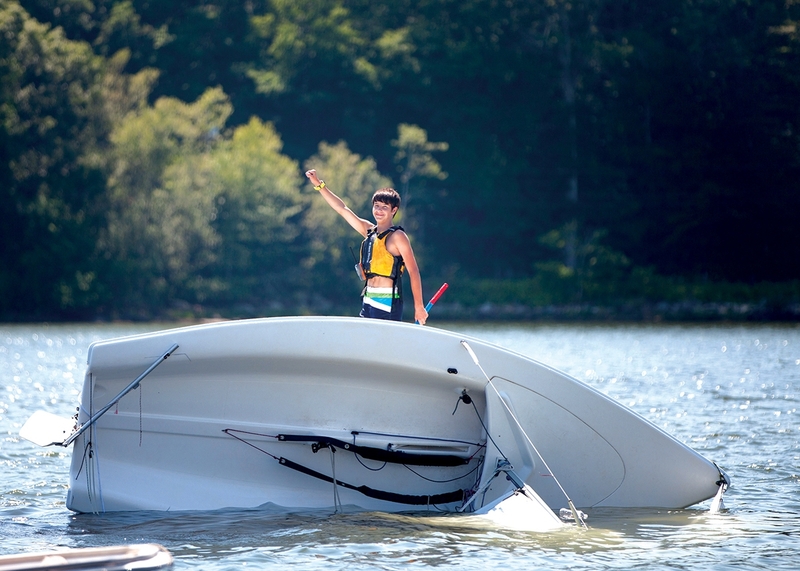 The Water Sport Specialty includes interests for true water-loving campers, such as sailing, kayaking, water trampoline and water play scape, tubing, waterskiing, and kneeboarding. No matter their swimming experience, all water sport campers are required to wear life jackets for all boating-related activities. Specialty campers spend two to three daily activity periods in their specialty activities, while also participating in Theme Days and other large-group camp activities. Costs range from $265-$550 for members, depending on the program. More information is at oceancommunityymca.org/locations/camp-watchaug/. Now in its 44th year providing summer programming, students entering Grades 6-12 have a host of water-related activities from which to choose at Project O. Sleepaway camps never get old, especially when you’ve spent the day sailing Long Island Sound and conducting research. Campers will make their temporary home for a week near the water while logging hours exploring nearby salt marshes and beaches and studying marine life that makes its home close to the shore. While focusing on team-building and leadership exercises, campers will learn how to use a host of oceanographic research equipment. Parents, are you interested in taking an afternoon cruise along the Sound? Well, first, your young marine scientist must attend a week-long day camp that enables students to study the habitats that comprise a coastal ecosystem. Campers will use trawl nets, plankton nets, and water chemistry kits to assist with their research. The fifth- to seventh-graders will also participate in games, art projects, and scientific experiments designed to reinforce what they’ve already learned. On the last day of camp, families are invited aboard the R/V EnviroLab for an afternoon cruise so that students can share what they’ve learned. Students will work aboard boats, along the shore, and in waterfront marine labs, and will culminate their week’s worth of research with a presentation. In addition, Project O hosts joint camps with Mystic Aquarium, Mystic Seaport, and NESS, and day camps are available. Program fees run around $800 for overnight camps and $400 for day camps, with military discounts available. Learn more at oceanology.org/summer-camps. Writers Katrina Gathers and Erin Shanley contributed to this story. New London STEM Magnet Middle School students enjoy an afternoon sail in Stonington with the New England Science & Sailing Foundation.